Do I need to check with my local council before building a pool house? Always contact your local council before embarking on any pool related project. You may need planning permission and there are likely to be other regulations and requirements that will affect your build. Where’s the best spot for a pool house or cabana? Ideally, you’d plan the location of your pool and pool house at the same time, but if the pool has already been installed, choose a location that enjoys the sun and is usually out of the wind. You need a good view of the pool and to be able to avoid casting too much shadow over the water. Ease of access to utilities including power and water is also important. How do I choose a pool house style? 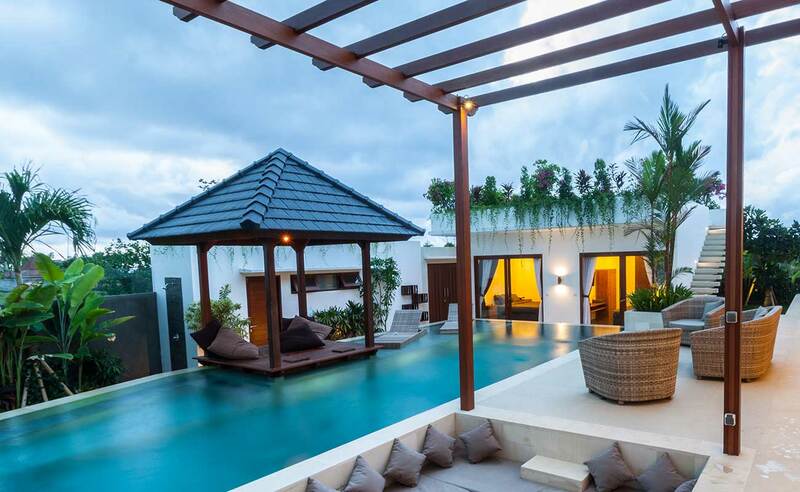 Pool houses and cabanas can be more casual in style than the principal home but will look more appealing and be more likely to add value to a property if key design elements link them to the main house. For example, a weatherboard pool house would work well with a weatherboard home painted the same or a toning shade. Similar coloured roofs would do the same job. It’s not about creating a mini version of the main house, but about trying to create a visual relationship between the two buildings. What do I need in a pool house? You’ll probably want privacy for changing into swimmers, a bathroom/shower/toilet, somewhere to sit, relax and perhaps watch TV or listen to music and somewhere to prepare and enjoy snacks and drinks. Modern pool houses often feature serving hatches and/or outdoor kitchens, bars and barbecue areas, which are ideal for entertaining. Make a list of all the things you’d like to be able to do in your space. Use it to brief your designer/builder or as a checklist if you’re considering a pool house kit. Can I build my own pool house or cabana from a kit? Ordering a pool house or cabana in kit form kit can be quicker than designing and building one especially for your home, but you’ll probably need professional help with preparing the site and construction. Plumbing and power connections must be undertaken by licensed professionals too. Always check what’s included in the price of the kit. Many only include the basics, so allow additional budget for extras such as kitchen facilities, a shower and/or air con. How should I furnish a pool house? Have fun with colour and pattern in your pool house or cabana – bright hues that might be too much indoors can be perfect for simpler, sunny spaces. Fabrics and furniture are likely to get damp as people come into the pool house in their swimmers. 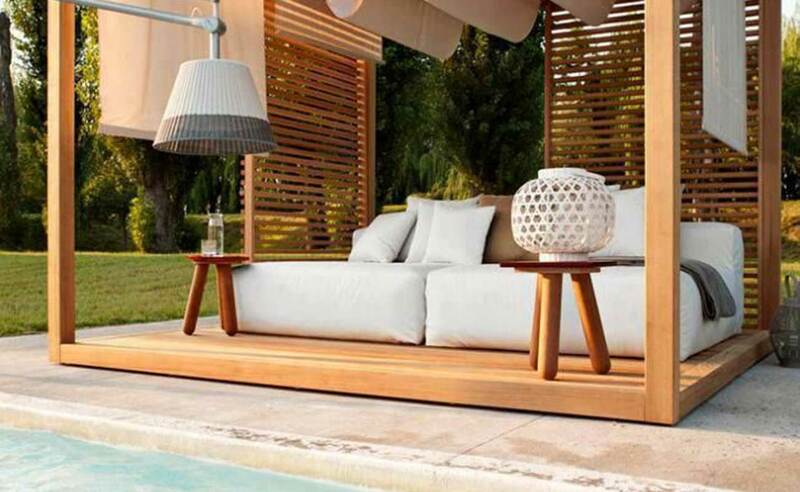 So choose robust, UV- and water-resistant fabrics, particularly for seating and cushions. What are the best floor coverings for a pool house? Choose non-slip floor coverings such as non-slip vinyl, ceramic floor tiles (timber effect tiles are durable and attractive) or even waterproof carpet. How much storage does a pool house need? Housing your pool pump, filter and heater requires a good amount of ventilated space. Pool chemicals should generally be stored separately. You’ll need plenty of storage even if your pool equipment remains away from the pool house. Plan to store towels, sunscreen, kitchen supplies and more indoors, while pool supplies and toys can be kept in outdoor covered storage. Do I need utilities for a pool house? All but the simplest cabanas will require utilities, so plan – and budget – for connecting power and water. How do I heat/cool a pool house? Ceiling fans or air con units can help cool your pool house in summer. Freestanding outdoor heaters will keep you warm well into autumn. You might be interested in reading this article: Plunge Pool Perfection. If you would like to discuss options and ideas for your outdoor renovation project in Auckland, please use the enquiry form on this page to provide us with your contact details. We will get in touch with you at a time that suits you to discuss your landscaping design and build. If you would like to provide us with more information about your project, we have a more comprehensive enquiry form on our "Get in touch" page too.